The news media or news industry are forms of mass media that focus on delivering news to the general public or a target public. These include print media (newspapers, newsmagazines), broadcast news (radio and television), and more recently the Internet (online newspapers, news blogs, etc.). Some of the first news circulations occurred in Renaissance Europe. These handwritten newsletters contained news about wars, economic conditions, and social customs and were circulated among merchants. The first printed news appeared by the late 1400s in German pamphlets that contained content that was often highly sensationalized. The first newspaper written in English was The Weekly Newes, published in London in 1621. Several papers followed in the 40's and 50's. In 1690, the first American newspaper was published in Boston by Richard Pierce and Benjamin Harris in Boston. However, it did not have permission from the government to be published and was immediately suppressed. In 1729, Benjamin Franklin began writing a new form of newspaper that was more satirical and more involved in civic affairs than previously seen. In 1735, John Peter Zenger was accused of seditious libel by the governor of New York, William Cosby. Zenger was found not guilty, largely in part to his attorney Andrew Hamilton, who later wrote a paper in which he argued that newspapers should be free to criticize the government as long as it was true. Later, with the ratification of the Bill of Rights in 1791, freedom of the press would be guaranteed by the First Amendment. In the 1830s, newspapers started seeking commercial success and turned toward reportage. This began with the New York Sun in 1833. Advancements in technology made it cheaper to print newspapers and "penny papers" emerged. These issues sought out local news and coverage of society. Later, news-gathering became a central function of newspapers. With the invention of the telegraph in 1845, the "inverted pyramid" structure of news was developed. Through the latter half of the 1800s, politics played a role in what newspapers published. By the end of the century, modern aspects of newspapers, such as banner headlines, extensive use of illustrations, "funny pages," and expanded coverage of organized sporting events, began to appear. Also, media consolidation began with many independent newspapers becoming part of "chains". The early 1900s saw Progressive Era journalists using a new style of investigative journalism that revealed the corrupt practices of government officials. These exposing articles became featured in many newspapers and magazines. The people who wrote them became labeled as "muckrakers". They became very influential and were a vital force in the Progressive reform movement. However, after 1912 muckraking declined. The public began to think the exposés were sensationalized, but they did make a great impact on future policies. During the 1920s, radio became a news medium, and was a significant source of breaking news. Although, during World War I, radio broadcasts in America were only given information about Allied victories because Great Britain had a monopoly on the transatlantic radio lines. For the newspapers, the government suppressed any radical or German papers during and after the war. With the introduction of the television came The Communications Act of 1934. It was an agreement between commercial television and the people of the United States that established that: The airways are public property; Commercial broadcasters are licensed to use the airways; The main condition for use will be whether the broadcaster served "the public interest, convenience, and necessity." During the Vietnam War, the media reporting directly challenged the government, drawing attention to the "credibility gap" — official lies and half-truths about the war. Television news continued to expand during the 1970s, and by 1990, more than half of American homes had cable systems and nationally oriented newspapers expanded their reach. 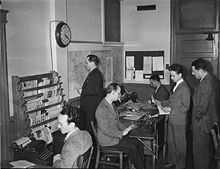 With technological advancements in the newsroom, notably the Internet, a new emphasis on computer-assisted reporting and a new blending of media forms emerged, with one reporter preparing the same story in print, online, and on camera for a newspaper's cable station. A "medium" (plural "media") is a carrier of something. Common things carried by media include information, art, or physical objects. A medium may provide transmission or storage of information or both. The industries which produce news and entertainment content for the mass media are often called "the media" (in much the same way the newspaper industry is called "the press"). In the late 20th century it became commonplace for this usage to be construed as singular ("The media is...") rather than as the traditional plural. "Press" is the collective designation of media vehicles that carry out journalism and other functions of informative communication, in contrast to purely propaganda or entertainment communication. The term press comes from the printing press of Johannes Gutenberg in the sixteenth century and which, from the eighteenth century, was used to print newspapers, then the only existing journalistic vehicles. From the middle of the 20th century onwards, newspapers also began to be broadcast and broadcast (radio news and television news) and, with the advent of the World Wide Web, also came the online newspapers, or cyberjornais, or webjornais. The term "press", however, was maintained. Reporters take notes and also take photographs or shoot videos, either on their own, by citizens or through a photographer or camera person. In the second phase, they organize the material, determine the focus or emphasis (identify the peg), and finally write their stories. The story is then edited by news or copy-editors (U.S. style) or sub-editors in Europe, who function from the news desk. The headline of the story is decided by the news desk, and practically never by the reporter or the writer of the piece. Often, the news desk also heavily re-writes or changes the style and tone of the first draft prepared by the reporter / writer originally. Finally, a collection of stories that have been picked for the newspaper or magazine edition, are laid out on dummy (trial) pages, and after the chief editor has approved the content, style and language in the material, it is sent for publishing. The writer is given a byline for the piece that is published; his or her name appears alongside the article. This process takes place according to the frequency of the publication. News can be published in a variety of formats (broadsheet, tabloid, magazine and periodical publications) as well as periods (daily, weekly, semi-weekly, fortnightly or monthly). Cover of 2512, a monthly newsmagazine published in Réunion. Many news organizations based in other media also distribute news online. How much they take advantage of the medium varies. Some news organizations use the web only or primarily. An exponentially growing phenomenon, the blogosphere can be abuzz with news that is overlooked by the press and TV networks. Due to the rise of social media involvement in news, the most common news value has become entertainment in recent years. Apropos of this was Robert F. Kennedy Jr.'s 11,000-word Rolling Stone article apropos of the 2004 United States presidential election, published June 1, 2006. By June 8, there had been no mainstream coverage of the documented allegations by President John F. Kennedy's nephew. On June 9, this sub-story was covered by a Seattle Post-Intelligencer article. Fake news articles are untruthful-on-purpose stories. They have the purpose of misleading the reader to think one way. With the rise of new media through social media, there has been an increase in fake news. This increase in fake news has progressed over time and continues to show, especially in today's media. The use of Twitter, Facebook, etc. has made it easier for false or misleading articles to be seen. The amount of misleading news articles that are produced are causing audiences to believe that every piece of information on the internet is true. A major problem is the issue of unbiased articles showing up in a timeline next to fake articles. This makes it hard for others to determine between what is fact and what is opinion. Specifically, the media coverage during the 2016 United States presidential election saw numerous misleading articles for both candidates. The concept was devised particularly for the media systems in the region of South East Europe, within the project South East European Media Observatory, gathering organisations which are part of the South East European Network for Professionalization of Media (SEENPM). ^ a b c d e f g "NOW with Bill Moyers. Politics & Economy. Milestones in Media and Politics | PBS". www.pbs.org. Retrieved 2018-03-08. ^ "Purdue OWL: Journalism and Journalistic Writing". owl.english.purdue.edu. Retrieved 2018-04-01. ^ Harcup, Tony (1 Mar 2016). "What is News? : News values revisited again". ^ Public Interest in News Topics Beyond Control of Mainstream Media, June 9, 2006. ^ As it happened: Mumbai attacks 27 Nov, BBC News, November 27, 2008. ^ Twitter In Controversial Spotlight Amid Mumbai Attacks, Information Week, November 29, 2008. ^ Hill, Taylor (February 2017). "Hook, Line and Sinker". Editor and Publisher. ^ "Login". search-proquest-com.nec.gmilcs.org. Retrieved 2018-09-12. ^ "Googling the news". The Economist. Retrieved 2018-09-05. ^ Lessig, Lawrence. "Institutional Corruption - LessigWiki". wiki.lessig.org. Retrieved 2016-03-11. ^ Petković, Brankica, ed. (2014). Media Integrity Matters: Reclaiming Public Service Values in Media and Journalism: Albania, Bosnia and Herzegovina, Croatia, Macedonia, Serbia (PDF). Ljubljana: Peace Institute.